"A king is forced to choose between love and political expediency. His decisions allow his country to slide into civil war, and turn his wife and son against him. 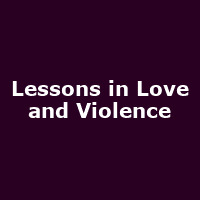 Lessons in Love and Violence is the latest collaboration between composer George Benjamin and playwright Martin Crimp, two of Britain's most celebrated artists. Much of that acclaim stems from their partnership, which produced first the chamber opera Into the Little Hill in 2008 and then in 2012 the large-scale work Written on Skin - which has since become the most performed new opera of the 21st century. "